Thank you for your interest in Type80 Heavy Duty Conveyor Belt Systems. We will be happy to discuss the pricing in more detail with you please fill in your details below and somebody will contcat you back with a quote. Alternatively please call us on 01772 690656 and please reference our part number - Type80 Heavy Duty Conveyor Belt Systems. Steel framed conveyor belt systems. 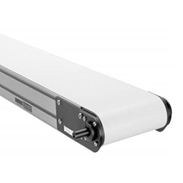 Type 80 is the generic title we give to our steel framed belt conveyors. These tough belt conveyors are avialable with such a large variety of different frame structures and motors, belts, rollers, stands and attachments that we would encourage you to contact us if you think that your application warrants a heavy steel construction. Rubber belts on conveyors for heavy applications can be of a chevron design if required or can be cleated for elevating products. • Steel frames can be painted or galvanised for external applications. • Motors can be internally or externally located depending on application. • Robust frameworks with welded and/or bolted construction. • Wide range of designs for all applications.